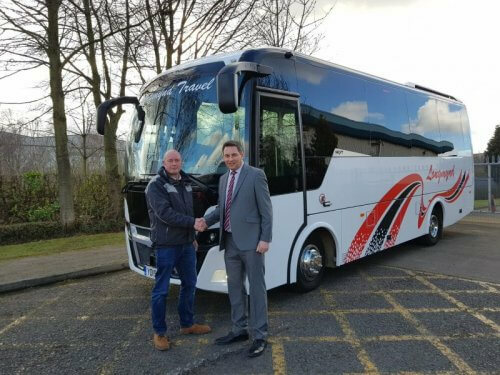 Longmynd Travel of Lee Cross in Shrewsbury has taken delivery of a new Indcar Next L8 from Moseley (PCV) Ltd. It is based on the Mercedes Benz Atego 1024L chassis and has a Euro VI 6-cylinder engine developing 240 bhp driven through an automatic gearbox and has rear air suspension. The Indcar Next L8 has 33 Active Force i40 Flair Seats with three-point seatbelts and leather-look headrests and piping. Driver and courier seats are trimmed to match the passenger grey seats. A roof-mounted Thermo King SR500 Air-conditioning unit keeps the interior cool. Other features include a full audio system with the addition of a driver and courier microphone, CCTV with linked reversing camera and monitor, rear offside emergency continental door, double glazed tinted side windows and a touch screen monitor which controls all the vehicle’s functions. Longmynd Travel was established in 1973 and provides private and corporate coach hire and also provides Shrewsbury Town Football Club with the official team coach.